Click here for photos of the Varsity Arabians’ win over Carrizo Springs! The Varsity Arabians continue their undefeated district run after beating Carrizo Springs and Crystal City. With an overall record of 21-5, Coach Jim Sessions and his team have a lead over the rest of the District, every other team has at least one loss to their district record. Carrizo Springs came to Devine on January 8th for their second district game and when back home with their first district loss. 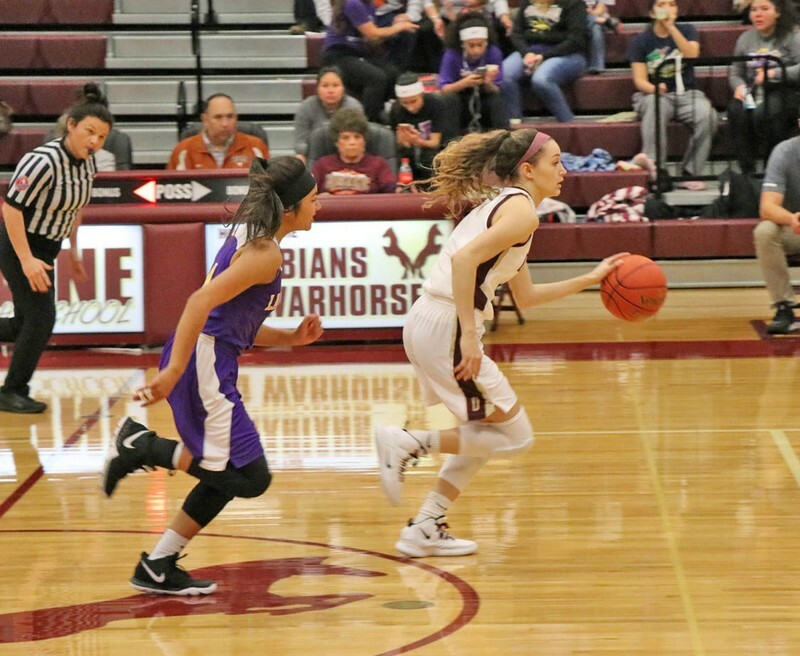 It looked like Carrizo Springs was going to be able to keep up with the Arabians with a 15-13 score at the end of the first but Devine pulled away in the second. Carrizo was never able to catch back up and the half ended 31-17. The second half was much the same with the Arabians outscoring them 17-4 in the third and 12-8 in the fourth. The game ended 55-29. “We were not very sharp in the first quarter. We got into early foul trouble and didn’t make good decisions with the ball. We did a good job of settling down in the second quarter to take a nice lead into the halftime break. We really came out strong in the 3rd quarter to take control of the game,” said Coach Sessions. The Arabians made 62.5% of their free throws and had 22 steals as a team. Alissa Stehle scored 5 points with 6 rebounds, 1 assist, and 4 steals. Sierra Pompa had 11 points, 13 rebounds, 2 assists, and 2 steals. Macey Hein had 6 points, 2 rebounds, 1 assist, 3 steals, and a blocked shot. Preslee Quisenberry had 14 points, 3 rebounds, and 3 steals. Megan Runyan had 11 points, 6 rebounds, 1 assist, and 2 steals. Clarissa Zamora had 2 point, 5 rebounds, 1 assist, and 4 steals. Gabby Rodriguez had a rebound and a steal. Ally Taylor had 2 points, 3 rebounds, and a steal. Maddie Mata had 4 points, 2 rebounds, 1 assist, 2 steals, and a blocked shot. Traveling down to Crystal City last Friday night, the Arabians played an aggressive game and came back with another district win. The first quarter started off slow but they pick up their offensive aggression in the second and ended the half 24-17. Crystal City tried to keep up but they were behind and outshot in the third and fourth quarters. The Arabians won 50-31. “I thought the girls played with a good intensity against Crystal City. We came out aggressive and we did a good job of keeping the ball in front of us on defense. We also did a good job rebounding the ball both ends of the floor. Offensively, we did a good job handling their pressure and attacking when we had numbers. I thought we did a good job of controlling the tempo of the game as well. It was a good win for us on the road. Very proud of how the team competed,” said Coach Sessions. Stehle had 4 points, 3 rebounds, 1 assist, and a steal. Pompa had 11 points, 13 rebounds, and 2 steals. Hein 4 points, 2 rebounds, 1 assist, and 2 steals. Quisenberry scored 12 points, 2 rebounds, 1 assist, and 2 steals. Kaylee Howard had 1 point, 1 rebound, and 1 steal. Runyan had 9 points and 12 rebounds. Zamora 1 point and 1 rebound. Mata had 8 points, 3 rebounds, 2 assists, and 4 steals. The Arabians will face Hondo at home January 22 and then travel down to Carrizo Springs January 25th.